Our train left at 9:40 Wednesday night to arrive in Beijing at 8 in the morning. Even though every other car we passed had beds for the passengers, ours managed to be one of two with standard seats on the whole train. Nevertheless, we had a comfortable ride, played euchre, slept, and arrived at the station before we knew it. After dropping of our luggage at the hotel, we headed straight for Tiananmen Square and the Forbidden City. Approaching the gates is an odd experience. 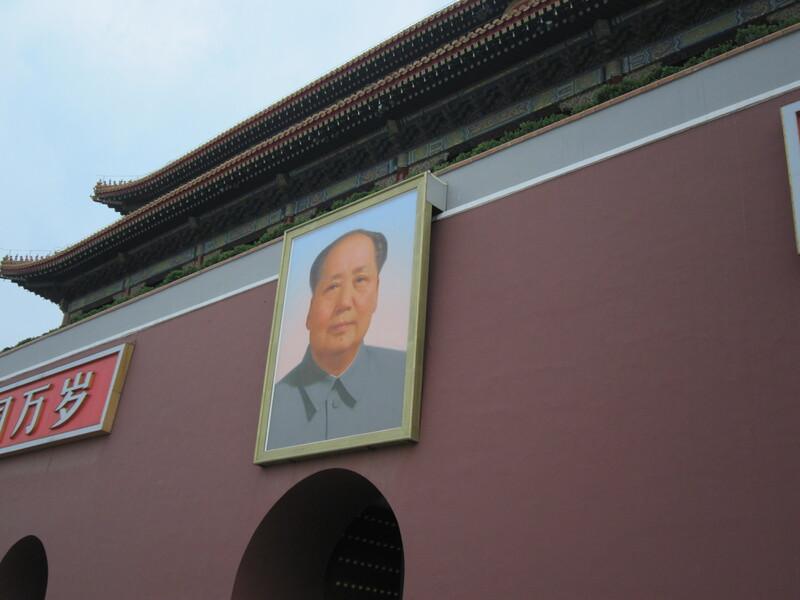 Nearly everyone that goes to Beijing has a picture in front of the gigantic portrait of Chairman Mao, but you still somehow stand in awe of the figure and plain red wall on which it is mounted. From here we entered the Forbidden City. Walking from one end to the other, you enter courtyard after courtyard with large temples and other buildings forming the perimeter. The famous portrait of Chairman Mao as you enter the Forbidden City. 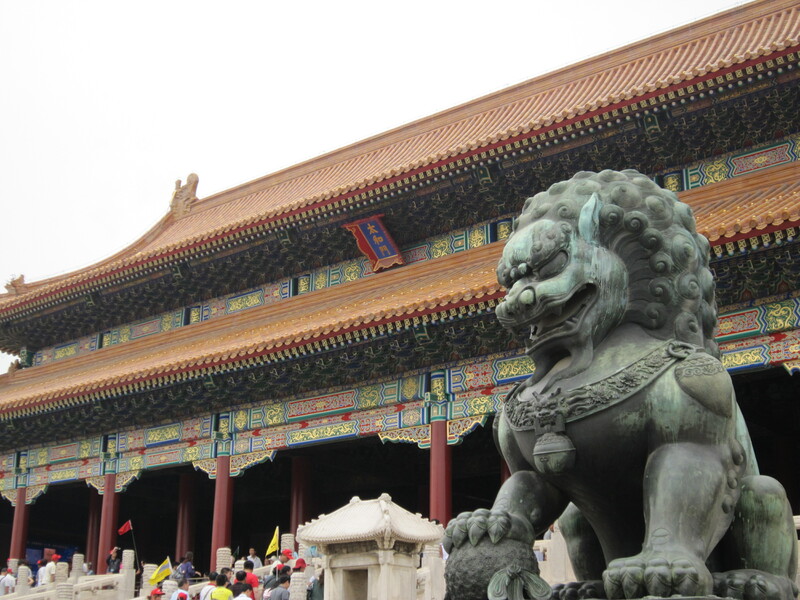 A Fu Lion guards a hall in the Forbidden City. The most interesting part to me has to be the architecture. The buildings are built using a dougong technique in which repeating brackets are placed on top of each other. This allows for the outward-protruding profile and roof that characterize many traditional Chinese temples. In addition, each building has a rank in terms of importance in the imperial system. Though most of the buildings appear relatively the same, they each have a rank as indicated by the number of animal figures on their roof. 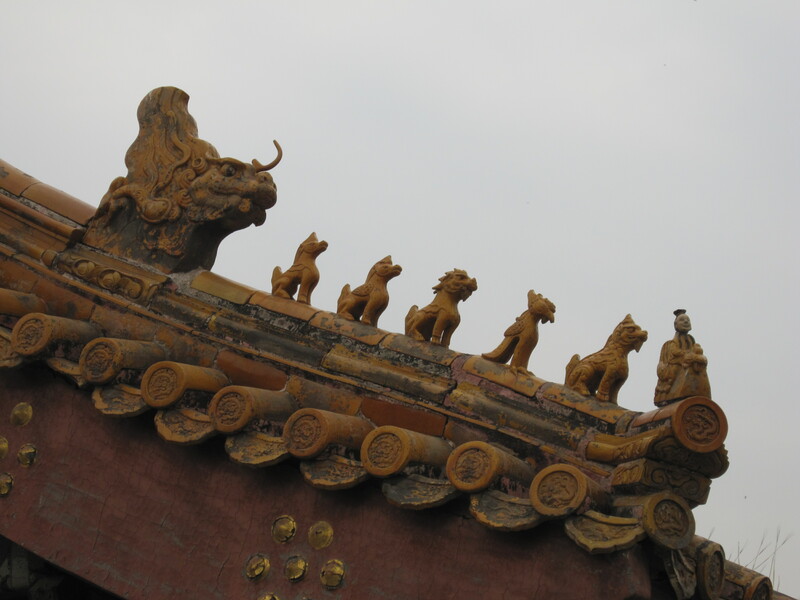 The most powerful building in ancient China is the Hall of Supreme Harmony near the center of the Forbidden City – it has twelve animals adorning its roof. The 5 animals on this building's roof make it a moderately important structure. This entry was posted in Chinese Culture and tagged Beijing, Forbidden City on June 13, 2010 by Jon Gold.